Any CrisisMapper who followed the social firestorm surrounding the gun map published by the Journal News will have noted direct parallels with the perils of Crisis Mapping. The digital and interactive gun map displayed the (lega-lly acquired) names and addresses of 33,614 handgun permit holders in two counties of New York. Entitled “The Gun Owner Next Door,” the project was launched on December 23, 2012 to highlight the extent of gun proliferation in the wake of the school shooting in Newtown. The map has been viewed over 1 million times since. This blog post documents the consequences of the gun map and explains how to avoid making the same mistakes in the field of Crisis Mapping. The backlash against Journal News was swift, loud and intense. The interactive map included the names and addresses of police officers and other law enforcement officials such as prison guards. The latter were subsequently threatened by inmates who used the map to find out exactly where they lived. Former crooks and thieves confirmed the map would be highly valuable for planning crimes (“news you can use”). They warned that criminals could easily use the map either to target houses with no guns (to avoid getting shot) or take the risk and steal the weapons themselves. Shotguns and hand-guns have a street value of $300-$400 per gun. This could lead to a proliferation of legally owned guns on the street. The consequences of publishing the gun map didn’t end there. Law-abiding citizens who do not own guns began to fear for their safety. A Democratic legislator told the media: “I never owned a gun but now I have no choice […]. I have been exposed as someone that has no gun. And I’ll do anything, anything to protect my family.” One resident feared that her ex-husband, who had attempted to kill her in the past, might now be able to find her thanks to the map. There were also consequences for the journalists who published the map. They began to receive death threats and had to station an armed guard outside one of their offices. One disenchanted blogger decided to turn the tables (reverse panopticon) by publishing a map with the names and addresses of key editorial staffers who work at Journal News. The New York Times reported that the location of the editors’ children’s schools had also been posted online. Suspicious packages containing white powder were also mailed to the newsroom (later found to be harmless). News about a burglary possibly tied to the gun map began to circulate (although I’m not sure whether the link was ever confirmed). But according to one report, “said burglars broke in Saturday evening, and went straight for the gun safe. But they could not get it open.” Even if there was no link between this specific burglary and the gun map, many county residents fear that their homes have become a target. The map also “demonized” gun owners. After weeks of fierce and heated “debate” the Journal News took the map down. But were the journalists right in publishing their interactive gun map in the first place? There was nothing illegal about it. But should the map have been published? In my opinion: No. At least not in that format. The rationale behind this public map makes sense. After all, “In the highly charged debate over guns that followed the shooting, the extent of ownership was highly relevant. […] By publishing the ‘gun map,’ the Journal News gave readers a visceral understanding of the presence of guns in their own community.” (Politico). It was the implementation of the idea that was flawed. I don’t agree with the criticism that suggests the map was pointless because criminals obviously don’t register their guns. Mapping criminal activity was simply not the rationale behind the map. Also, while Journal News could simply have published statistics on the proliferation of gun ownership, the impact would not have been as … dramatic. Indeed, “ask any editor, advertiser, artist or curator—hell, ask anyone whose ever made a PowerPoint presentation—which editorial approach would be a more effective means of getting the point across” (Politico). No, this is not an endorsement of the resulting map, simply an acknowledgement that the decision to use mapping as a medium for data visualization made sense. The gun map could have been published without the interactive feature and without corresponding names and addresses. This is eventually what the jour-nalists decided to do, about four weeks later. Aggregating the statistics would have also been an option in order to get away from individual dots representing specific houses and locations. Perhaps a heat map that leaves enough room for geographic ambiguity would have been less provocative but still effective in de-picting the extent of gun proliferation. Finally, an “opt out” feature should have been offered, allowing those owning guns to remove themselves from the map (still in the context of a heat map). Now, these are certainly not perfect solutions—simply considerations that could mitigate some of the negative consequences that come with publishing a hyper-local map of gun ownership. In conclusion, the “smoking guns” (no pun intended) were never found. Law enforcement officials and former criminals seemed to imply that thieves would go on a rampage with map in hand. So why did we not see a clear and measurable increase in burglaries? The gun map should obviously have given thieves the edge. 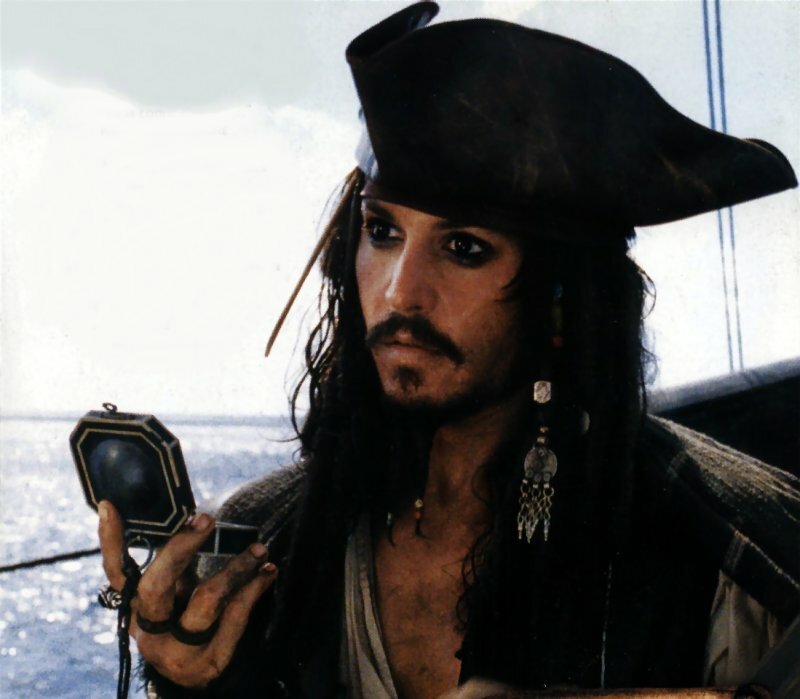 But no, all we have is just one unconfirmed report of an unsuccessful crime that may potentially be linked to the map. Surely, there should be an arsenal of smoking guns given all the brouhaha. First, just because data is publicly-accessible does not mean that a map of said data is ethical or harmless. Second, there are dozens of ways to visualize and “blur” sensitive data on a map. Third, a threat and risk mitigation strategy should be standard operating procedure for crisis maps. Fourth, since crisis mapping almost always entails risk-taking when tracking conflicts, the benefits that at-risk communities gain from the resulting map must always and clearly outweigh the expected costs. This means carrying out a Cost Benefit Analysis, which goes to the heart of the “Do No Harm” principle. Fifth, a code of conduct on data protection and data security for digital humanitarian response needs to be drafted, adopted and self-enforced; something I’m actively working on with both the International Committee of the Red Cross (ICRC) and GSMA’s Disaster Response Program. Sixth, the importance of privacy can—and already has—been hijacked by attention-seeking hypocrites who sensationalize the issue to gain notoriety and paralyze action. Non-action in no way implies no-harm. Update: Turns out the gan ownership data was highly inaccurate! Conversely, the research also identified reasons why some hesitate to use social media during disasters: (1) privacy and security fears, (2) accuracy concerns, (3) access issues, and (4) knowledge deficiencies. By the latter they mean the lack of knowledge on how to use social media prior to disasters. While these hurdles present important challenges they are far from being insurmountable. Educa-tion, awareness-raising, improving technology access, etc., are all policies that can address the stated constraints. In terms of accuracy, a number of advanced computing research centers such as QCRI are developing methodologies and pro-cesses to quantify credibility on social media. Seasoned journalists have also been developing strategies to verify crowdsourced information on social media. The approach has already been used in a real-world applications: a Census Bureau project called OnTheMap, “which gives researchers access to agency data. Also, differential privacy researchers have fielded preliminary inquiries from Facebook and the federally funded iDASH center at the University of California, San Diego, whose mandate in large part is to find ways for researchers to share biomedical data without compromising privacy.” So potential solutions are al-ready on the horizon and more research is on the way. This doesn’t mean there are no challenges left. There will absolutely be more. But the point I want to drive home is that we are not completely helpless in the face of these challenges. What, if any, unique roles do various social media play for commu-nication during disasters? Are some functions that social media perform during disasters more important than others? To what extent can the current body of research be generalized to the U.S. population? To what extent can the research on social media use during a specific disaster type, such as hurricanes, be generalized to another disaster type, such as terrorism? Have any thoughts on what the answers might be and why? If so, feel free to add them in the comments section below. Incidentally, some of these questions could make for strong graduate theses and doctoral dissertations. To learn more about what people actually tweet during this disasters, see these findings here. The good people at the Sudan Sentinel Project (SSP), housed at my former “alma matter,” the Harvard Humanitarian Initiative (HHI), have recently written this curious piece on crisis mapping and the need for an “ethical compass” in this new field. They made absolutely sure that I’d read the piece by directly messaging me via the @CrisisMappers twitter feed. Not to worry, good people, I read your masterpiece. Interestingly enough, it was published the day after my blog post reviewing IOM’s data protection standards. To be honest, I was actually not going to spend any time writing up a response because the piece says absolutely nothing new and is hardly pro-active. Now, before any one spins and twists my words: the issues they raise are of paramount importance. But if the authors had actually taken the time to speak with their fellow colleagues at HHI, they would know that several of us participated in a brilliant workshop last year which addressed these very issues. Organized by World Vision, the workshop included representatives from the International Committee of the Red Cross (ICRC), Care International, Oxfam GB, UN OCHA, UN Foundation, Standby Volunteer Task Force (SBTF), Ushahidi, the Harvard Humanitarian Initiative (HHI) and obviously Word Vision. There were several data protection experts at this workshop, which made the event one of the most important workshops I attended in all of 2011. So a big thanks again to Phoebe Wynn-Pope at World Vision for organizing. We discussed in-depth issues surrounding Do No Harm, Informed Consent, Verification, Risk Mitigation, Ownership, Ethics and Communication, Impar-tiality, etc. As expected, the outcome of the workshop was the clear need for data protection standards that are applicable for the new digital context we operate in, i.e., a world of social media, crowdsourcing and volunteer geographical informa-tion. Our colleagues at the ICRC have since taken the lead on drafting protocols relevant to a data 2.0 world in which volunteer networks and disaster-affected communities are increasingly digital. We expect to review this latest draft in the coming weeks (after Oxfam GB has added their comments to the document). Incidentally, the summary report of the workshop organized by World Vision is available here (PDF) and highly recommended. It was also shared on the Crisis Mappers Google Group. By the way, my conversations with Phoebe about these and related issues began at this conference in November 2010, just a month after the SBTF launched. I should confess the following: one of my personal pet peeves has to do with people stating the total obvious and calling for action but actually doing absolutely nothing else. Talk for talk’s sake just makes it seem like the authors of the article are simply looking for attention. Meanwhile, many of us are working on these new data protection challenges in our own time, as volunteers. And by the way, the SSP project is first and foremost focused on satellite imagery analysis and the Sudan, not on crowdsourcing or on social media. So they’re writing their piece as outsiders and, well, are hence less informed as a result—particularly since they didn’t do their homework. Their limited knowledge of crisis mapping is blatantly obvious throughout the article. Not only do the authors not reference the World Vision workshop, which HHI itself attended, they also seem rather confused about the term “crisis mappers” which they keep using. This is somewhat unfortunate since the Crisis Mappers Network is an offshoot of HHI. Moreover, SSP participated and spoke at last year’s Crisis Mappers Conference—just a few months ago, in fact. One outcome of this conference was the launch of a dedicated Working Group on Security and Privacy, which will now become two groups, one addressing security issues and the other data protection. This information was shared on the Crisis Mappers Google Group and one of the authors is actually part of the Security Working Group. To this end, one would have hoped, and indeed expected, that the authors would write a somewhat more informed piece about these issues. At the very least, they really ought to have documented some of the efforts to date in this innovative space. But they didn’t and unfortunately several statements they make in their article are, well… completely false and rather revealing at the same time. (Incidentally, the good people at SSP did their best to disuade the SBTF from launching a Satellite Team on the premise that only experts are qualified to tag satellite imagery; seems like they’re not interested in citizen science even though some experts I’ve spoken to have referred to SSP as citizen science). In any case, the authors keep on referring to “crisis mappers this” and “crisis mappers that” throughout their article. But who exactly are they referring to? Who knows. On the one hand, there is the International Network of Crisis Mappers, which is a loose, decentralized, and informal network of some 3,500 members and 1,500 organizations spanning 150+ countries. Then there’s the Standby Volunteer Task Force (SBTF), a distributed, global network of 750+ volunteers who partner with established organizations to support live mapping efforts. And then, easily the largest and most decentralized “group” of all, are all those “anonymous” individuals around the world who launch their own maps using whatever technologies they wish and for whatever purposes they want. By the way, to define crisis mapping as mapping highly volatile and dangerous conflict situations is really far from being accurate either. Also, “equating” crisis mapping with crowdsourcing, which the authors seem to do, is further evidence that they are writing about a subject that they have very little understanding of. Crisis mapping is possible without crowdsourcing or social media. Who knew? Clearly, the authors are confused. They appear to refer to “crisis mappers” as if the group were a legal entity, with funding, staff, administrative support and brick-and-mortar offices. Furthermore, and what the authors don’t seem to realize, is that much of what they write is actually true of the formal professional humanitarian sector vis-a-vis the need for new data protection standards. But the authors have obviously not done their homework, and again, this shows. They are also confused about the term “crisis mapping” when they refer to “crisis mapping data” which is actually nothing other than geo-referenced data. Finally, a number of paragraphs in the article have absolutely nothing to do with crisis mapping even though the authors seem insinuate otherwise. Also, some of the sensationalism that permeates the article is simply unnecessary and poor taste. The fact of the matter is that the field of crisis mapping is maturing. When Dr. Jennifer Leaning and I co-founded and co-directed HHI’s Program on Crisis Mapping and Early Warning from 2007-2009, the project was very much an exploratory, applied-research program. When Dr. Jen Ziemke and I launched the Crisis Mappers Network in 2009, we were just at the beginning of a new experiment. The field has come a long way since and one of the consequences of rapid innovation is obviously the lack of any how-to-guide or manual. These certainly need to be written and are being written. So, instead of stating the obvious, repeating the obvious, calling for the obvious and making embarrassing factual errors in a public article (which, by the way, is also quite revealing of the underlying motives), perhaps the authors could actually have done some research and emailed the Crisis Mappers Google Group. Two of the authors also have my email address; one even has my private phone number; oh, and they could also have DM’d me on Twitter like they just did. “Mobile Technologies for Conflict Management: Online Dispute Resolution, Governance, Participation” is the title of a new book edited by Marta Poblet. I recently met Marta in Vienna, Austria during the UN Expert Meeting on Croudsource Mapping organized by UN SPIDER. I’m excited that her book has just launched. The chapters are is divided into 3 sections: Disruptive Applications of Mobile Technologies; Towards a Mobile ODR; and Mobile Technologies: New Challenges for Governance, Privacy and Security. My colleagues Jessica Heinzelman, Rachel Brown and myself also contributed one of the chapters. I include the introduction below. 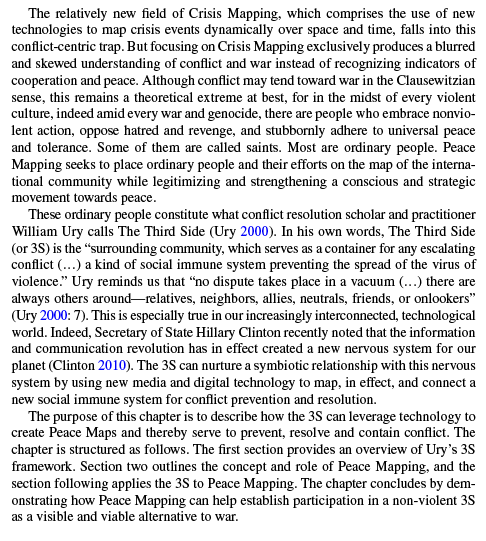 I had long wanted to collaborate on a peer-reviewed chapter in which I could combine my earlier study of conflict resolution theory with my experience in conflict early warning and crisis mapping. 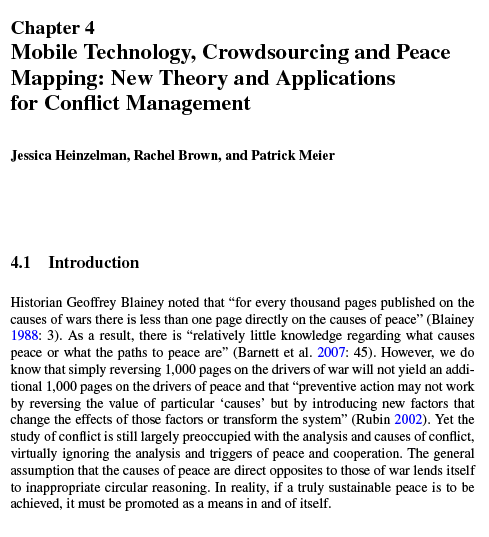 See also this earlier blog post on “Crowdsourcing for Peace Mapping.” I’ve been a big fan of Will Ury’s approach ever since coming across his work while at Columbia University back in 2003. Little did I know then that I’d be co-authoring this book chapter with two new stellar colleagues. Rachel has taken much of this thinking and applied it to the real world in her phenomenal project called Sisi ni Amni, or “We Are Peace.” You can follow them on Twitter. Jessica now serves on their Advisory Board.